Rome was a republic for 500 years before turning autocratic when Julius Caesar became dictator in 44 BCE. The Roman Empire proceeded to conquer the world of Europe/Middle East/North Africa and made the Mediterranean Sea into a Roman lake. Contemporarily, China was prospering under the Han Empire (漢) although the two never made contact except through the tenuous Silk Road. By c300 CE, the empire was too big to be ruled by one center. It was split into the Western Empire centered on Rome, and the Eastern Empire centered on Constantinople. Simultaneously, the Christian church was split into the Latin Roman Catholic church and the Eastern Orthodox church. The Western Empire ended in 476 CE under the repeated invasion of the barbarians, and Europe plunged into a thousand years of Dark Ages. Similarly, China was ravaged by the barbarians for a few hundred years (五胡亂華). 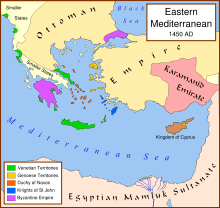 The Eastern Empire, or the Byzantine Empire, shrank but survived for another 1,000 year until it was conquered by the Ottoman Turks in 1453. Throughout that period, Byzantium remained a shining beacon of knowledge, culture and Christianity, and Constantinople was its wealthy and sophisticated capital. 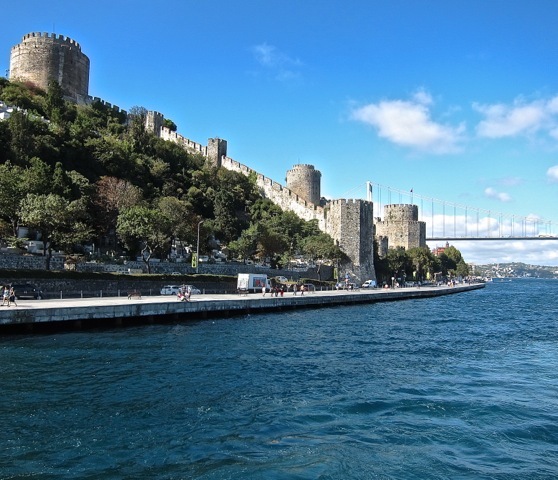 Constantinople, renamed Istanbul by the Turks, connects the Mediterranean and Black Seas and straddles trade routes. It still has plenty of Roman relics. 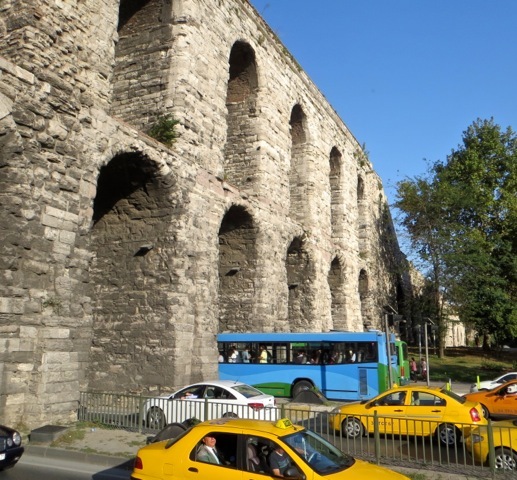 This aqueduct carried water into hundreds of storage cisterns in the ancient city. 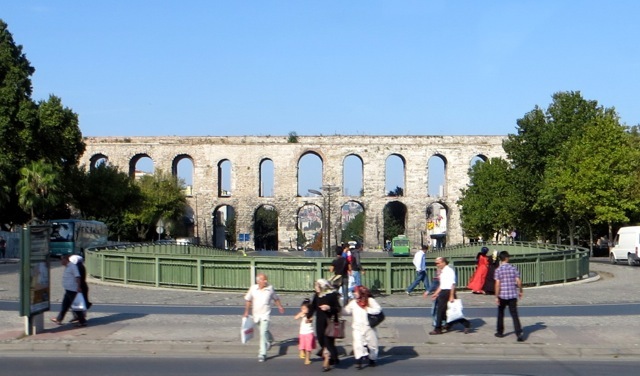 As a structural engineer, I am very impressed by this massive aqueduct which survived earthquakes for 2,000 years. 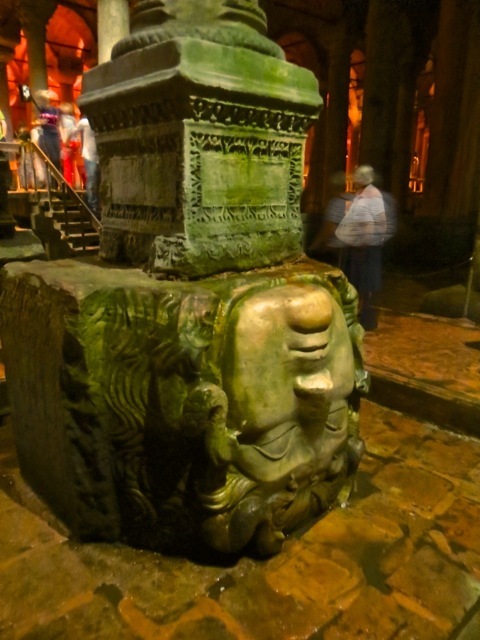 Its stones pressed against one another and are held in place without any binding mortar. 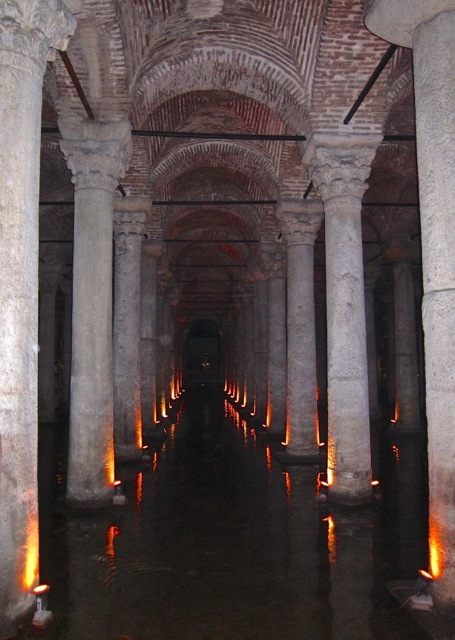 One extant cistern is the underground Basilica Cistern. Hundreds of columns support arches and a vaulted roof, covering an area of about 500 feet by 200 feet. A Medusa’s head is installed upside down perhaps to negate its legendary power to turn men into stone. 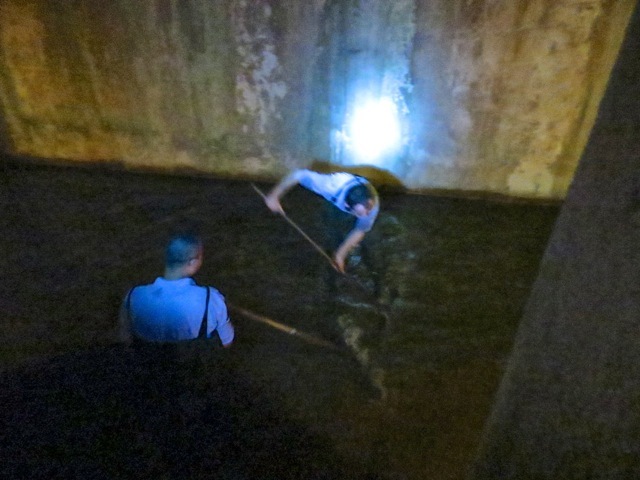 I saw two workmen clean the dark pool bottom with scrapers. 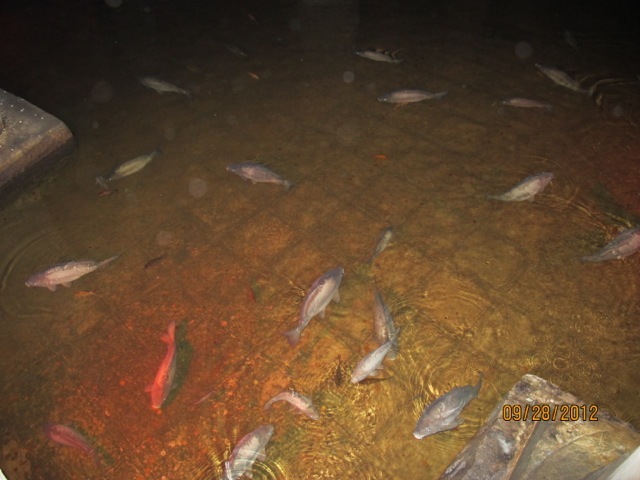 The pool is stocked with fish which are fed by tourists. 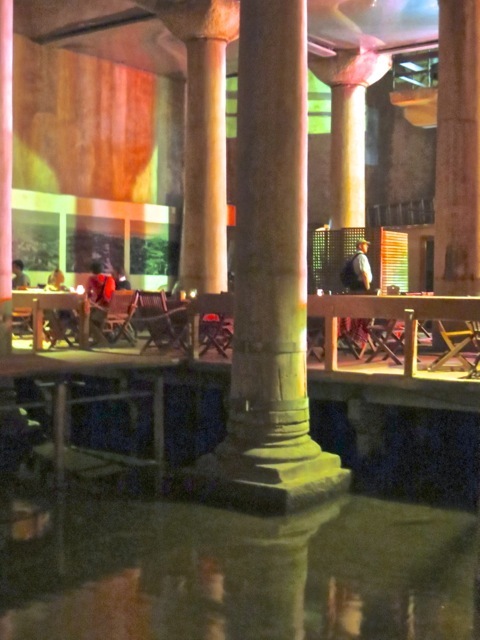 Tourists, in turn, are fed in the cistern cafe. We stayed in a boutique hotel by the sea. 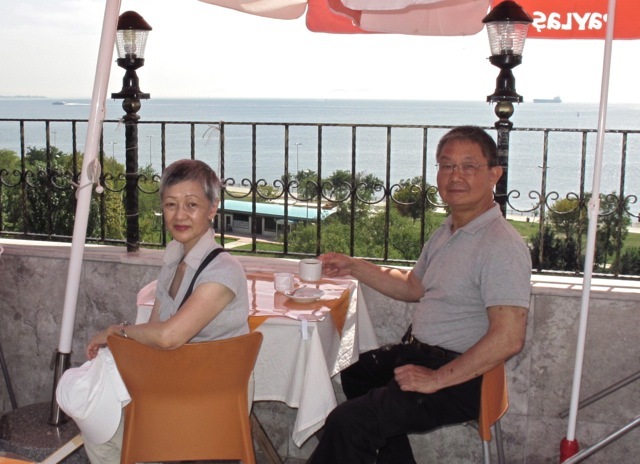 We enjoyed breakfast on its rooftop cafe. 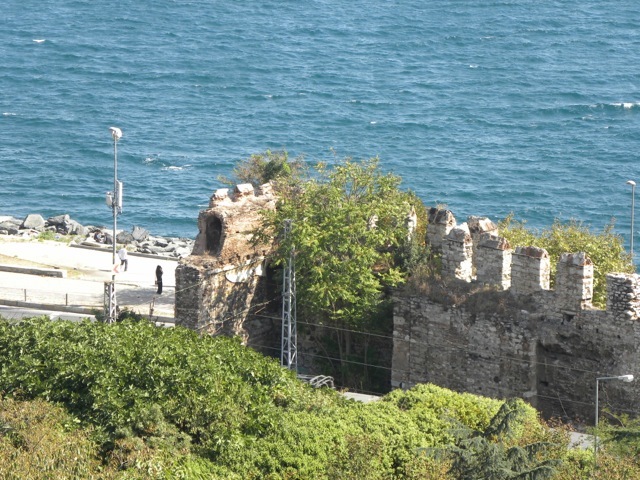 From our hotel, we could see the relic of the Constantinople sea wall which used to border the water. 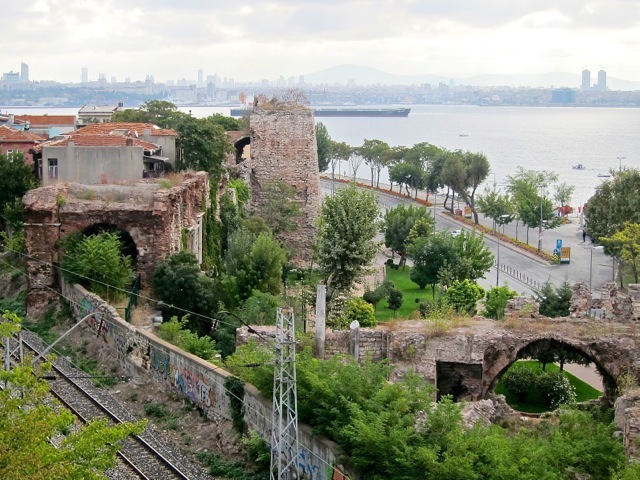 The sea wall surrounded three sides of the city, and a land wall covered the fourth side. The walls of Constantinople repulsed many sieges until it was conquered by the Fourth Crusade in 1204 on their way to fight the Muslims. The Latin Christians attacked the sea wall from Venetian warships, overpowered the Orthodox Christian defenders, and sacked the city. This sea wall relic sits between a railroad and a highway. The highway is named J F Kennedy Highway in honor of the US president. 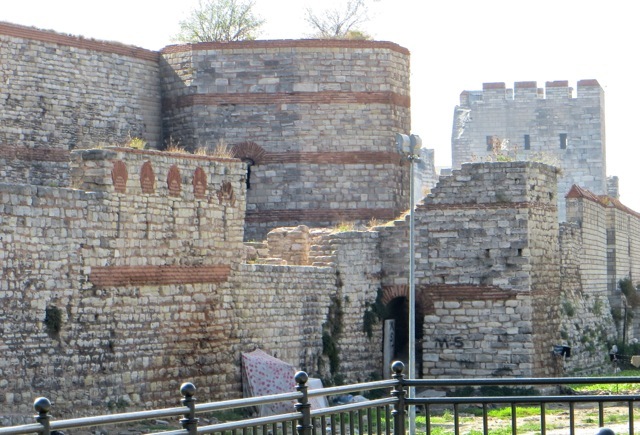 The formidable wall of Constantinople is composed of a high inner wall with 96 towers, a lower outer wall, and a deep moat. 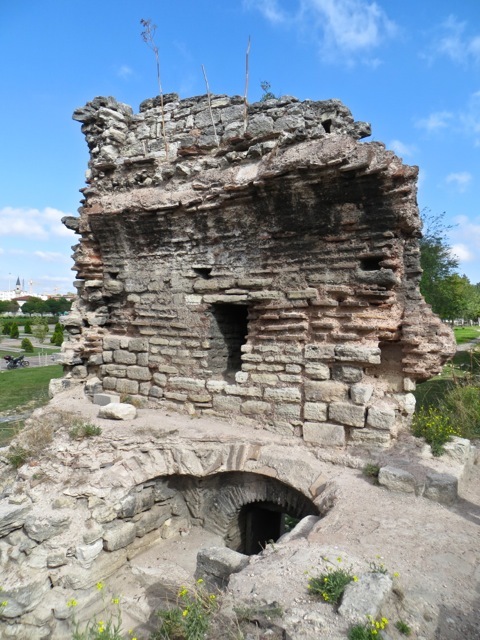 It successfully repulsed seventeen sieges in 800 years as Medieval armies could not field weapons powerful enough to penetrate the well-constructed wall. 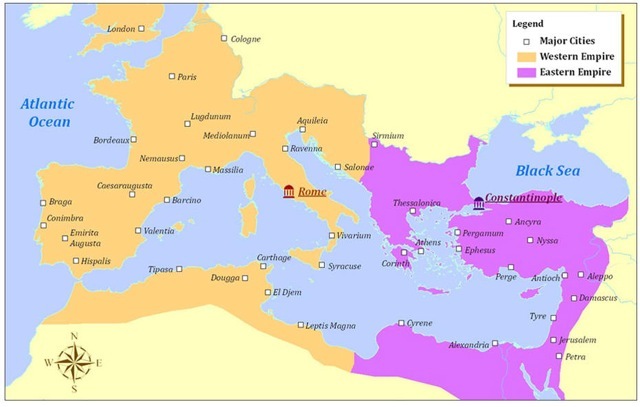 By 1450, Byzantium shrank into two tiny purple-colored areas on this map. The Turkic tribe which migrated earlier from Central Asia to Middle East expanded and surrounded Byzantium. 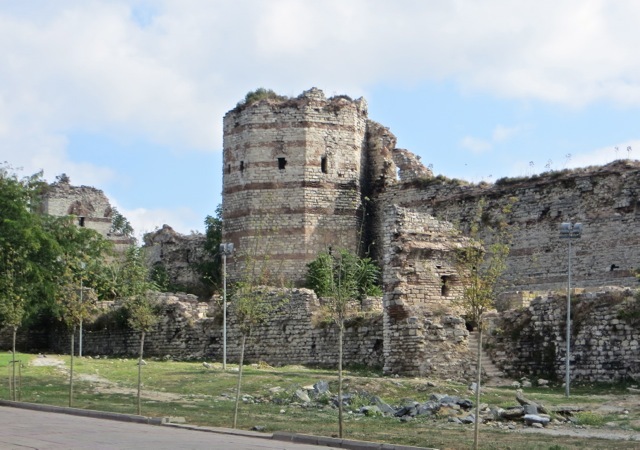 To tighten its stranglehold, the Ottoman Turks built the Fortress of Europe only a few miles from Constantinople. 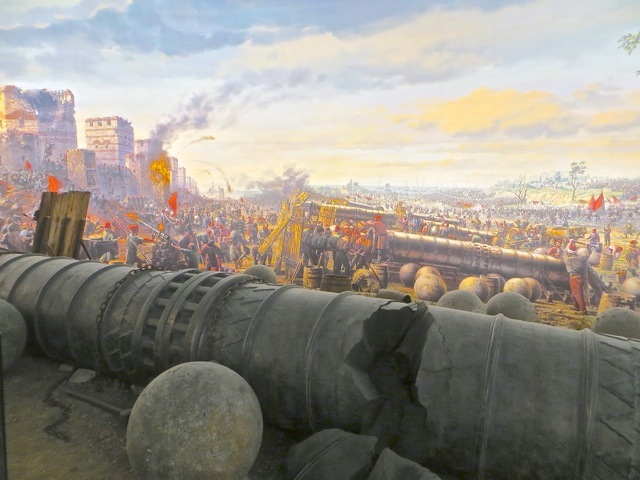 The Ottoman sultan employed a Hungarian engineer who forged huge 27 feet long cannons to blast apart the wall in 1453. A stirring panorama is housed in a special building to commemorate this battle, mesmerizing Sally who normally is not interested in war topics. The wall today remains freshly broken as if the battle was fought the day before. I could almost see the Byzantine defenders fighting on the wall as the Ottoman soldiers clamber through the breaches. A bastion barely stands after it was destroyed by cannon fire. As the wall no longer protects the city in the era of cannons, the wall was left unrepaired after the battle. Today, Turkey protects itself with a different kind of fortress. 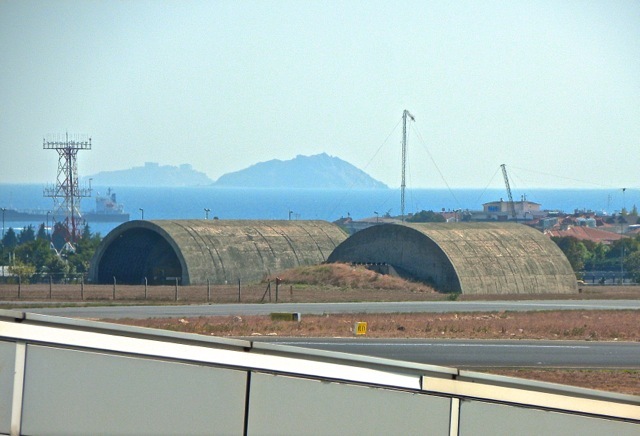 These concrete bunkers in an airport protect jet fighters which would scramble at a moment’s notice. Posted by Robert Wu on Tuesday, October 16, 2012, at 4:36 pm. Filed under Uncategorized. Follow any responses to this post with its comments RSS feed. You can post a comment or trackback from your blog.